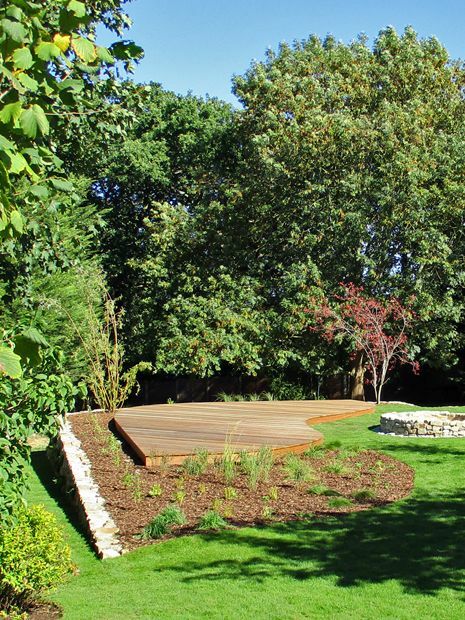 With half an acre of land sloping 6 metres, tucked away behind the A1000 in Whetstone N20, we excavated and introduced 450 tonnes of natural materials over 3 months to repurpose an old tennis court into an ecologically thriving natural landscape garden for a young family. Harmonising, enriching and aptly rejuvenating an existing indigenous palette of mature trees, we planted over 60 native British species of broad habitat ranges, and with only 4 guys, quenched by 1500 cups of coffee and endless gallons of water during the hottest, driest summer in half a century, this modern, organically enticing and thoroughly wildlife-friendly native garden with biodiverse flora was created. 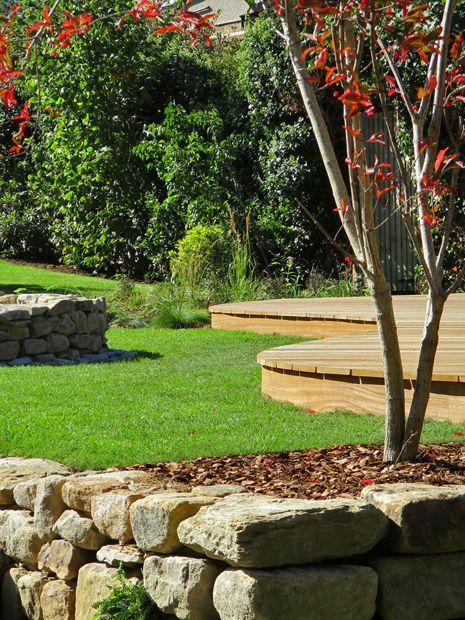 Pivotally anchoring the centre of the garden, viewed from every vantage point of a large l-shaped outline, the 2.5-metre circular stone fire pit serves as a fun element for both grown-ups and kids, as well as part of the garden's ongoing maintenance. With many large trees requiring pruning and coppicing, firewood is generated regularly and utilised to generate flames for family gatherings. 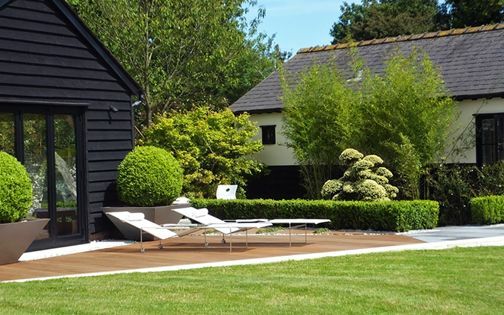 Built at a low bench height, the fire pit creates a handy social hub, situated between the deck and play areas – its form nestled within the wood's contours. Our clients' 3 children, two boys and a girl, adore their new home, where they enjoy abundant space to entertain themselves and their mates. 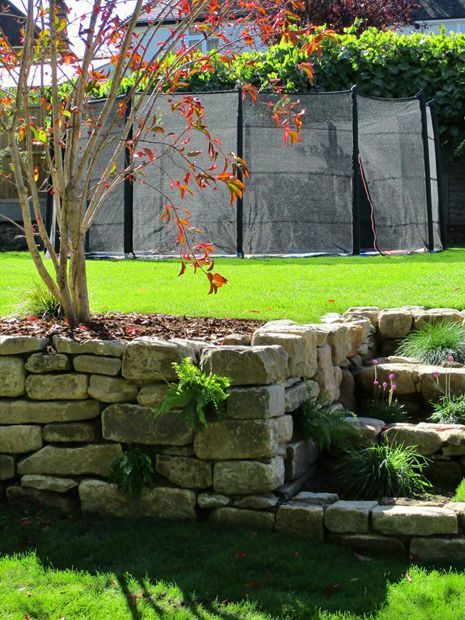 We sunk an existing 5-metre round trampoline into the ground for a better connection within the garden, while improving inherent level changes throughout for safer transitions. The older boy loves his new basketball court, paved in wood-like tiles, along with a mini football grass pitch. 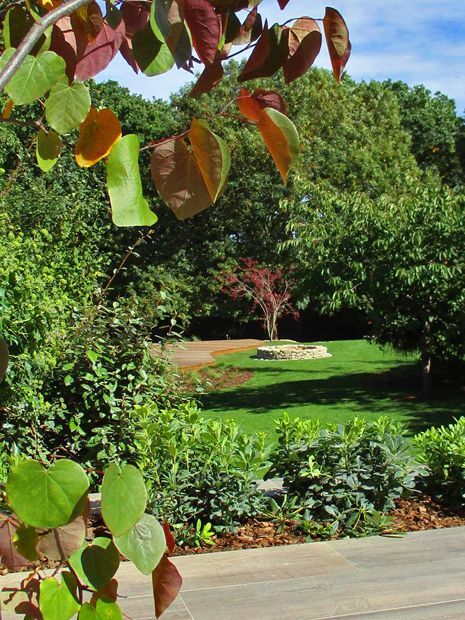 The kids' play areas are situated in the shaded part of the garden, dappled by the silhouette of a large Oak tree, further planted with the soft foliage of native forest species. 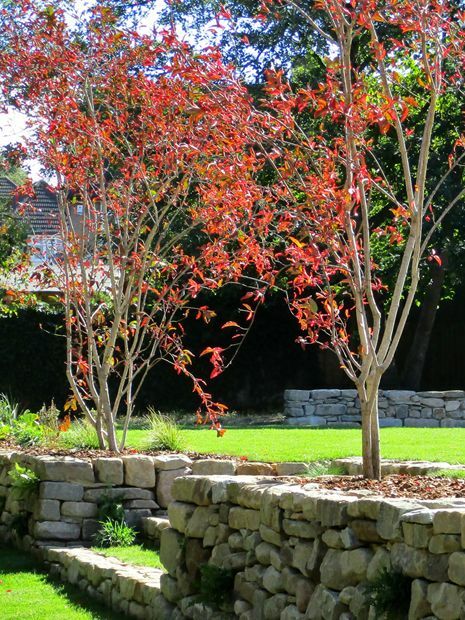 For us, the rationale of planting solely native floras required little reasoning, fittingly responding to the site's natural beauty, majestic indigenous trees and truly rural feel. 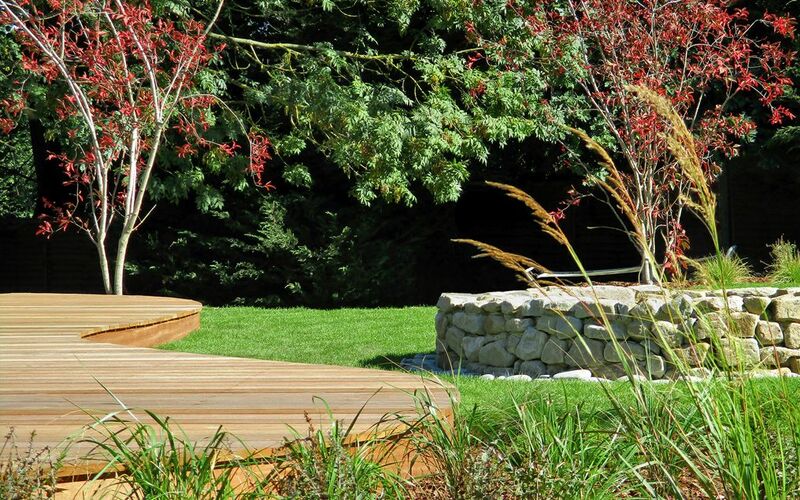 A comprehensive plant schedule, including over 60 native species, portrays the 5 distinct British Isles' natural habitats, from coastal to grassland and woodland, forming an unadulterated platform for renewal, growth and needed authenticity. 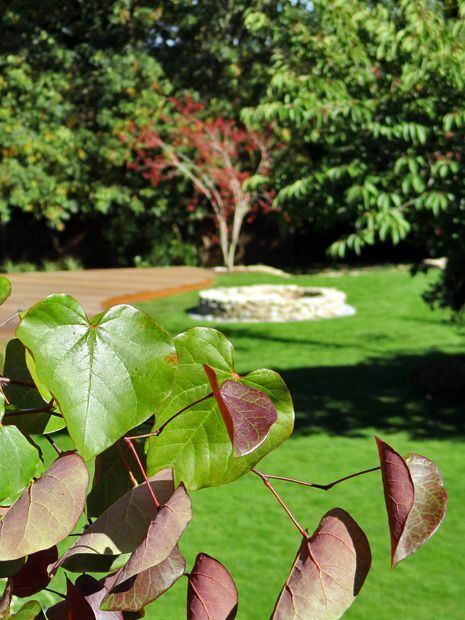 Simplicity, seasonality and environmental responsibility truly impel the story of this place – a verdant vignette of apt biodiversity in a contemporary landscape garden context with foresighted owners. The leafy avenues surrounding this Whetstone home undulate across a hilly terrain, creating hazy green swathes of foliage as far as the eye can see. Situated over heavy clay, yet improved by decades of suburban cultivation and an exceptional profusion of tree leaf litter, the plant life here is prospering, evident from every street corner. 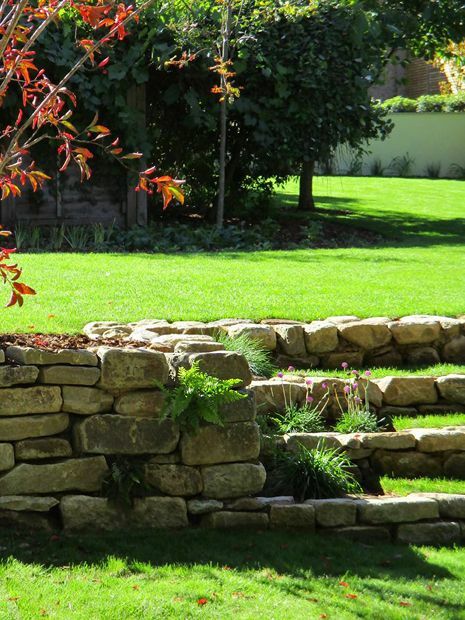 With the average local back garden at around 250 square metres in size, fivefold than in Central London, this unique plot was extended by the previous owner, annexing several sections to form a 0.5-acre landscape garden – 8 times larger than its neighbouring properties – one of the foremost reasons our clients chose to live in this place. 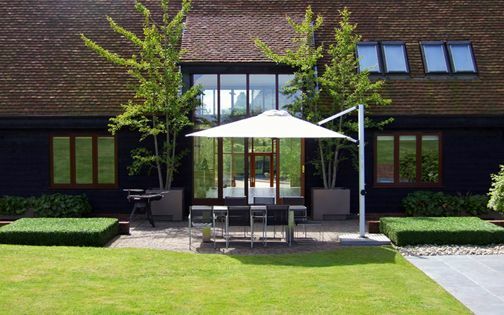 Energetic yet wholly laid-back, tech-savvy but nature-loving all the same, and graciously hospitable, are the warm qualities our clients brought to a like-minded wavelength. 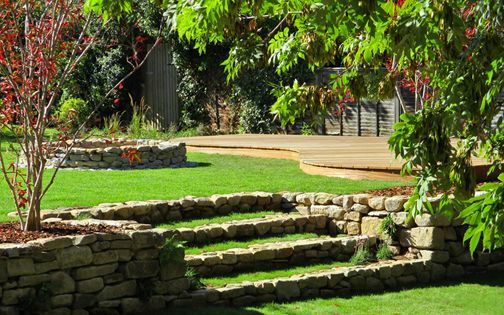 With 2 young kids, a teenager, 2 large dogs and Simba the cat, this lively troupe trustingly embraced the ideas we sought to integrate within the new layout of their North London natural landscape garden. 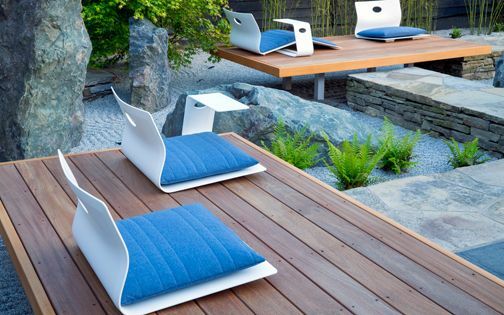 With a family-oriented blueprint, a new patio and repurposing an obsolete tennis court into a liveable garden as the primary requirements, the stage was set for a 3-month insightful journey to unveil the limitless potential of this site, and mark the household's transition from country living to town life. At best, nature and its myriad facets in ecosystems, wildlife and beauty symbolises our very existence, while at worst, has merely been commoditised – marginalised into social media snippets, charity pleas and utopian screen saver imageries. 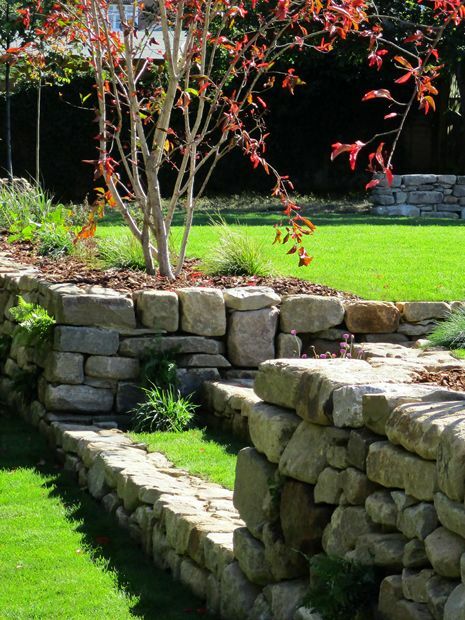 Granted, only few of us have the apt acreage to accommodate ideal natural garden environments, when discovering nature's essence is circumscribed within the virtual world. Yet, experiencing firsthand, in situ, the spirit of such a vast and vital process leads not only to crucial conservation, thoughtful betterment and sympathetic husbandry, but also to the ways in which individuals can sustain private landscapes in a more ecological approach across all scales of land – a sentiment supported in this natural garden. Habitat destruction has furthered beyond redemption into every corner of the globe, and while a fundamental understanding of the environment should be part and parcel of all aspects of our lives – from education to science and technology, the vital answerability and genuine comprehension of this agenda remain largely at the hands of individuals. 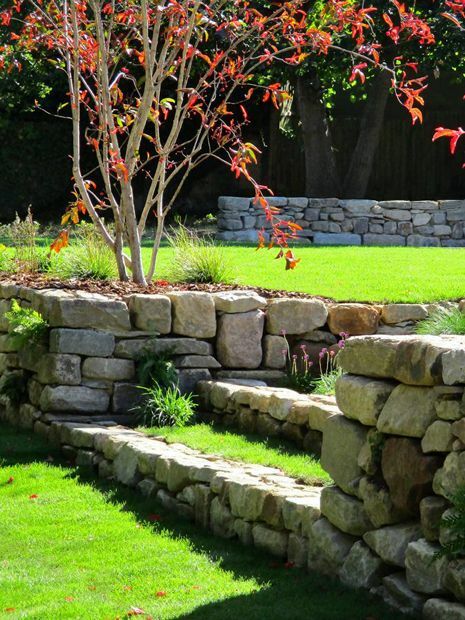 Here, in a Whetstone private garden, rather than impose a predictable, rigid approach to landscape design, both ourselves and the clients endorsed an ecological mindset which enables an organic canvas to prosper naturally, holistically and steadily, evolving into a sustainable and biodiverse garden – enchantingly of its place. 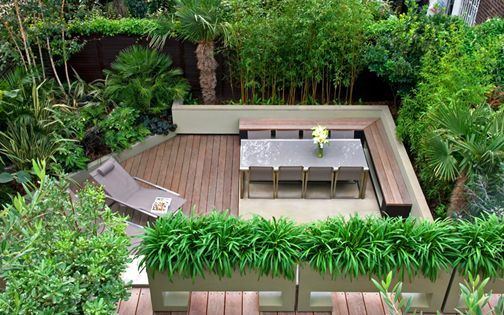 While at times the design process of a small urban garden may take a long duration, due to the intricacies of each detail and nuanced concepts, here, the master plan evolved rather swiftly, even though the footprint extends to half an acre. 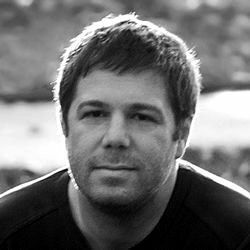 We take our time absorbing a new site's environment and discussing our vision with the clients in depth, and in this instance, although the initial outlook materialised intuitively and instantly, its essence was received wholeheartedly – defining a decisive, solid framework to steer a lengthy project. 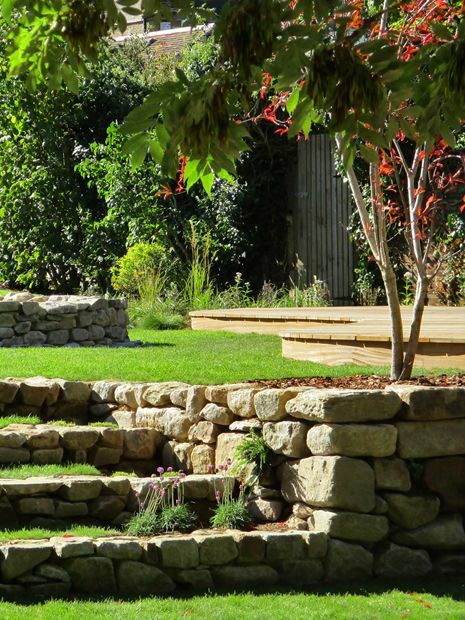 Relevantly signifying the toponym of Whetstone, and inducing an organic texture, the Lancashire stone utilised to retain the various gradients throughout the site completes our natural landscape garden sympathetically in walls, steps and a fire pit. 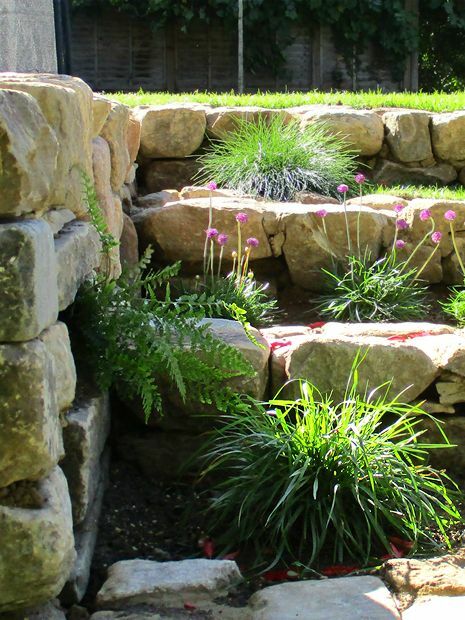 This structural approach to hard landscaping creates a tactile, lived-in narrative, infusing the cardinal element of time through both ruggedness and mellowness, allowing the wildness of native ferns, Bugle and Bellflower species to emanate naturally from crevices in randomly laid masonry. 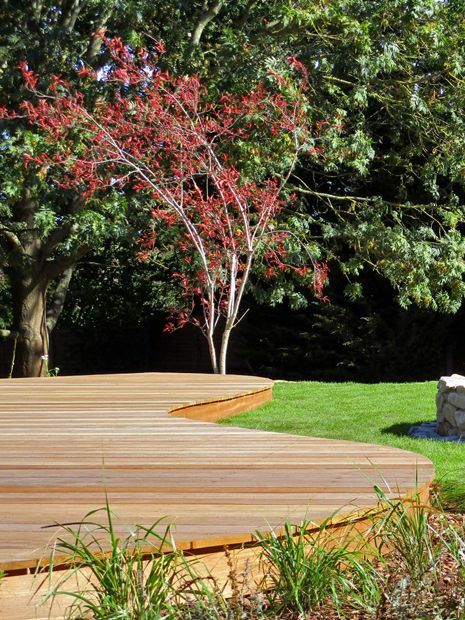 A curved hardwood deck contrasts these tones with its smooth grain, forming an elevated platform in the garden's sunniest spot. Tiles textured as wood produce an upper patio by the house, linking the indoor floor, and further providing a hard-wearing basketball court surface. 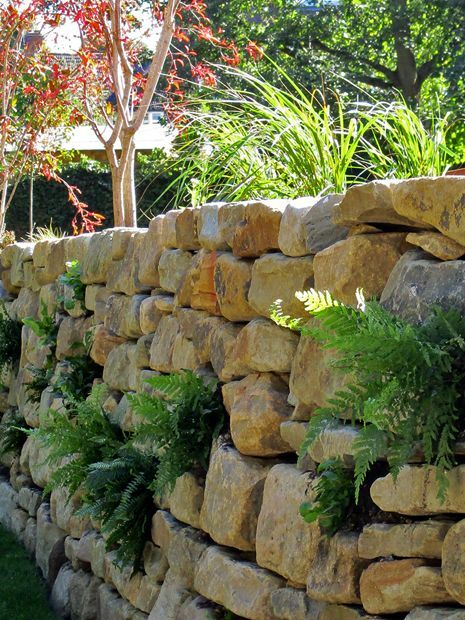 This anthology of traditional and modern materials evokes the feel of a contemporary country landscape, albeit in a North London garden. Exclusively native, the sun meadows are interspersed with ornamental grasses, adding stature to an eye-catching array of indigenous British perennials; it's a celebration of native glory with Purple loosestrife, Betony, Meadowsweet, Hemp agrimony, Yarrow, Harebell, Bellflower and Quaking, Bush, Tufted hair and Wavy hair grasses. 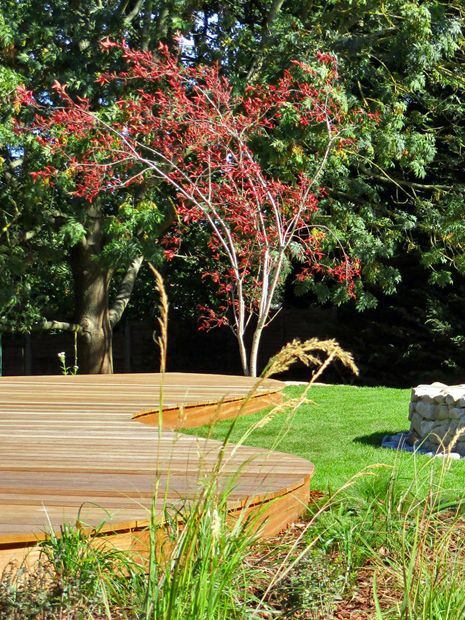 Wispiness, natural colours and a long season of interest distinguish these sweeping, sinuous borders flanking the sun deck. Contrasting this environment, a woodland opposite is carpeted with Anemone, Cowslip, Cranesbill, Foxglove, Primrose, Ostrich fern, Lily of the valley and Woodruff, where planting suitable native species is harmonious with the site and promotes minimal maintenance. 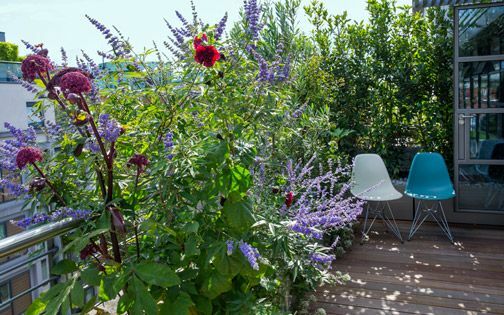 From an enormous heap of disused concrete and pervasive weeds, this garden was transformed into an ecologically-minded, wildlife-friendly, heavenly habitat, where decoration is made obsolete and site-responsive agendas form a wholesome synthesis. 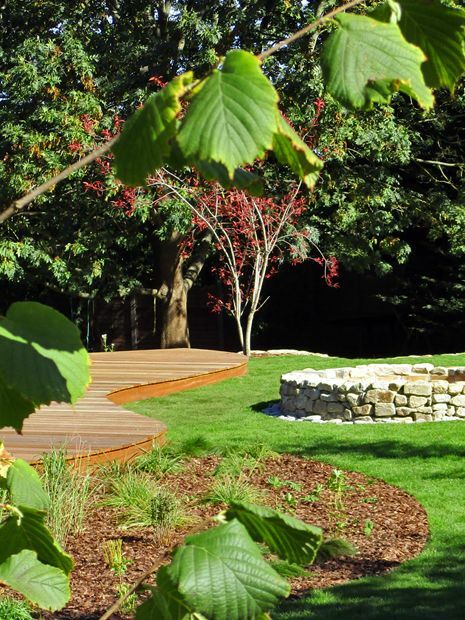 Multi-seasonal, multi-sensory and positively organic, this natural landscape garden enriches our clients' family life with biophilic well-being and many years of attuned cultivation to follow, completing an array of native trees, where nature isn't honed, but rather let loose – in Whetstone!